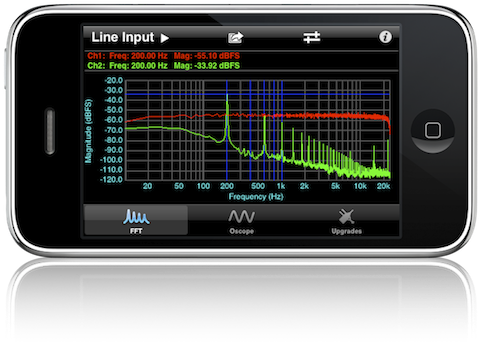 iAnalyzer is a FFT based professional software to analyze the audio signal for iPhone and iPod Touch. -High performance software design for Real Time Analyzing(RTA) and complex graph displaying. -Works on 44K sample rate, 20~20k Hz frequency output. -FFT spectrum, Octave and 1/3 Octave result display. -Colored curve depend on the dB value. -Flex FFT size, 4K, 8K, or 16K. -2D or 3D or Mix 2D&3D display. -History result display while in 3D mode. -High precision peak frequency computation(average-error < 0.1%). -Auto peak frequency tracing, up to 3 peaks can be displayed simultaneously and each one be linked from text to the graph clearly. -Frequency to music scale converter, you can use iAnalyzer as a professional instrument tuner, or to test if any sound is tuneful. -Touch in the result area to use the measure line, bordered label means where is a peak. -Current waveform display and summary waveform display. -Record at any position and red color to mark the latest recording, unlimited recording time. -Move in the waveform area or touch on the bottom of the area to change the current position, iAnalyzer re-compute and update graph automatically. You can also change the position while playing. -The internal mic of iPhone first generation can only works on 8K sample rate, you need head-set to achieve 44k. Faber Acoustical, LLC announced today that SignalScope 2.0 for iPhone and iPod touch devices is available for immediate download on the iTunes App Store. With version 2, SignalScope users can now enjoy the full features of the Pro version without having to pay full price for SignalScope Pro. Faber Acoustical’s SignalScope 2.0 includes full and partial upgrades, via in-app purchase, that unlock additional tools and functionality, which previously were only available in the Pro version. In addition to enabling users to upgrade to the full functionality of SignalScope Pro for iPhone all at once, SignalScope 2.0 offers incremental upgrades. 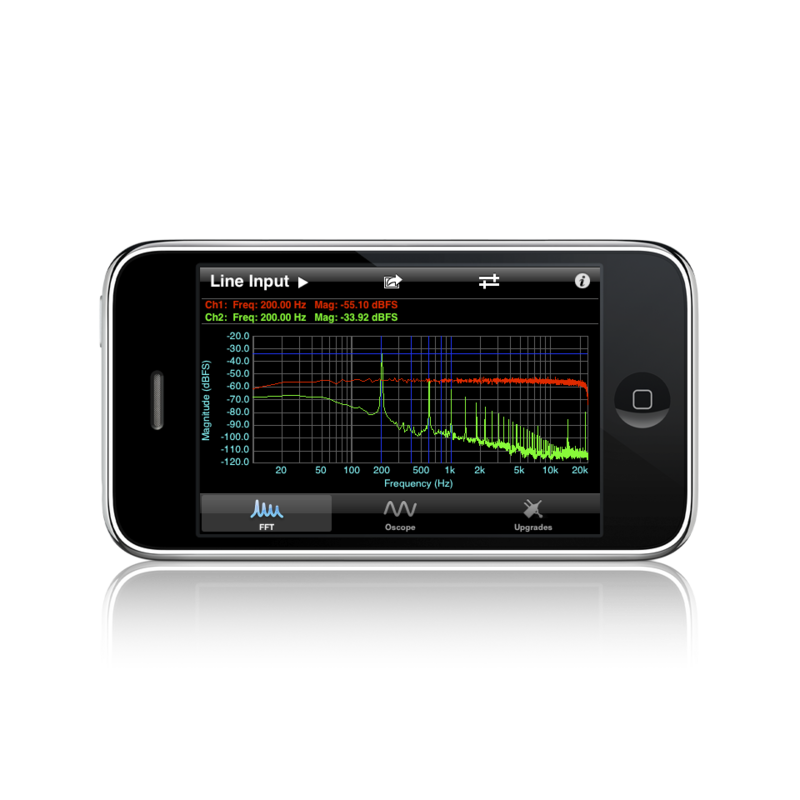 Available upgrades include individual tools, such as the level meter (functionally equivalent to the sound level meter tool in the popular SoundMeter app), octave analyzer, and signal generator. Another upgrade can be purchased to enable data acquisition features, such as saving data to text or MAT files, which can then be downloaded to any Mac or PC via a standard web browser. and a Data acquisition upgrade (text and MAT file data capture) with downloading to Mac or PC via a standard web browser for $19.99. IMPORTANT NOTE: iPod touch devices require additional external hardware to get audio signals into SignalScope. For audio signals, the 1st gen iPod touch requires a dock connector input device (such as the MacAlly iVoice Pro) to be used with SignalScope. All other devices can perform measurements with the headset connector, but using a stereo dock connector input device is recommended for the highest quality measurements. SignalScope is now available for download on the iPhone App Store for $24.99 (USD). External hardware may be required for analog input capability. More information on SignalScope can be found at Faber Acoustical online. More information regarding suitable input devices for specific iPhone or iPod touch models can be found on the Faber Acoustical blog.